We all loved the off the shoulder trend that came this spring and summer. But now that fall is in full effect do we see this trend going away? NO! Luckily for all of us who probably invested in one too many off the shoulder tops and dresses last season, we can still wear them, layer them, and strut them this fall as the fashion forecast as them hotter than ever. If the bareness of a complete off the shoulder top is too much to handle as the temperatures dip, you can still sport the trend with shoulder cut outs like this top from Bebe. 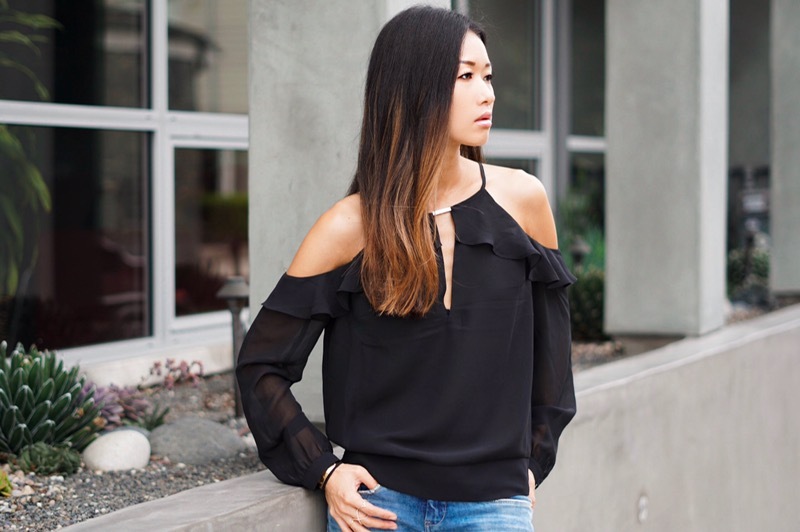 This dreamy, ruffled, open shoulder top with metal accent is a perfect day to night blouse. It can be styled in so many ways with jeans like I wore here, or with leather pants, a skirt, and shorts. To keep consistent with the sheer, airy top, I added a lightweight trench with this look. This trench features an open front and draped collar and is made of the same georgette material as the blouse. Draped or worn over this look adds a beautiful flow and balance to this overall look. I love the off shoulder top from Bebe! It really accentuates your shoulders and the ruffles add the extra dash of femininity! Thank you Bernice and you are so correct, the ruffles definitely add that girlie touch! I totally agree, as long as weather doesn’t prohibit it, show those shoulders! 🙂 Over here it’s too cold for that already, but you can keep rocking that style for a while longer! Luckily I live in SoCal which doesn’t drop too much in temperature. I can bare these shoulders just a bit longer. =) Hope you had a nice weekend Thomas! I love off shoulder tops very much too. Lucky for us living in CA and TX, we don’t get too cold in fall/winter, we can still rock this trend. Those ruffles are so pretty too. Keeping up with great style, Christine! Totally agree Jo! Thank you so much, it’s great to be back to blogging after my vacay! You look amazing babe! Any season of the year you are slaying. Awww you are so sweet Amy. Congrats on becoming the Bebe Ambassador! Amazing job! I love cold shoulder tops, you look fabulous babe! Thank you Susanne, you are too kind! Hope you are having an amazing Monday! Oh my god girl, work those heels!!! Love this casual look! Thank you Jessi! Gotta love Bebe and this top with the metal details and ruffles is too pretty to pass up! Like yourself, I absolutely just loveee the off shoulder look as well since I think it makes an outfit look a little more sultry. Looking soo great here babe! Can’t wait to meet you in person some day at a blogger event in LA. Thank you Atsuna! I know, would love to meet you and your amazing hair in person soon! The style is fab and that top is gorgeous! So in love with cold shoulder styles! Thanks Yvonne. I can’t let go of the off the shoulder trend yet! Fantastic outfit! Simple, elegant and so chic! Loved it babe! Thanks babe, hope you are having a great week so far! Your top is beautiful and so are the shoes.You look so great girl.Super stylish. I think, I’m one of the few girls who aren’t that much into off shoulder. 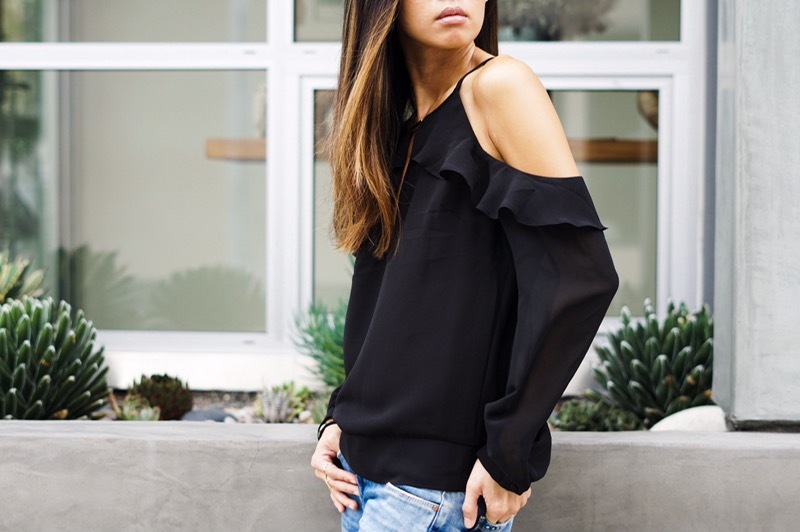 I actually do not even have a single off shoulder top … But I really like this trend on other’s and your outfit with that flowing blouse really is gorgeous! Thank you Camille. Have a great day babe! 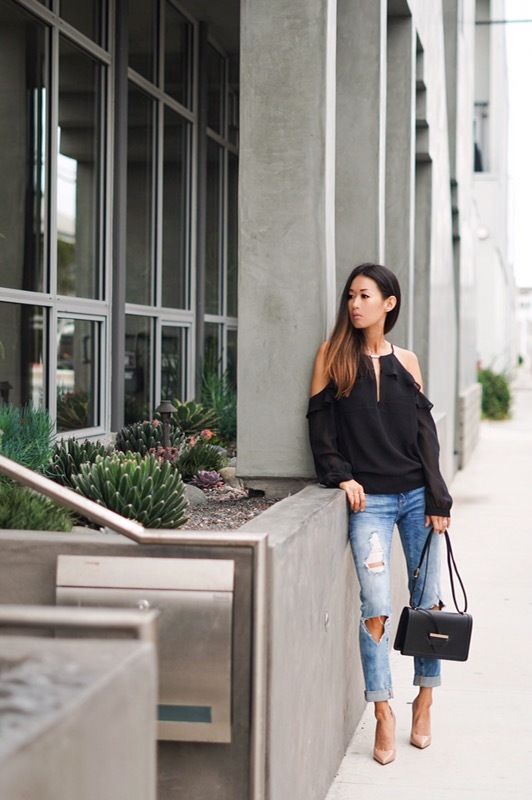 I’m in love in the way you styled this elegant shirt with those boyfriend jeans! It all just work so beautifully together! Thank you Iga! I wasn’t a fan of the loose fitting jeans until recently and now I can’t go back. They are much more forgiving than skinny jeans and more comfy too! Thank you Lindsey. These are one of my go-to jeans because they aren’t quite skinny jeans and not quite boyfriend jeans and are super soft and comfy! Thanks Michelle! I used to always save my money back in the day to go and shop at Bebe so it brings back memories when I wear their pieces today too! Thank you Kreshma. Black is one of my favorite colors to wear but there are so many different styles and structures of black clothes and it’s fun to show the different ways you can wear a simple black top! It’s a good transition from off the shoulder to showing a little bit of shoulder right? Thanks for all your support babe!